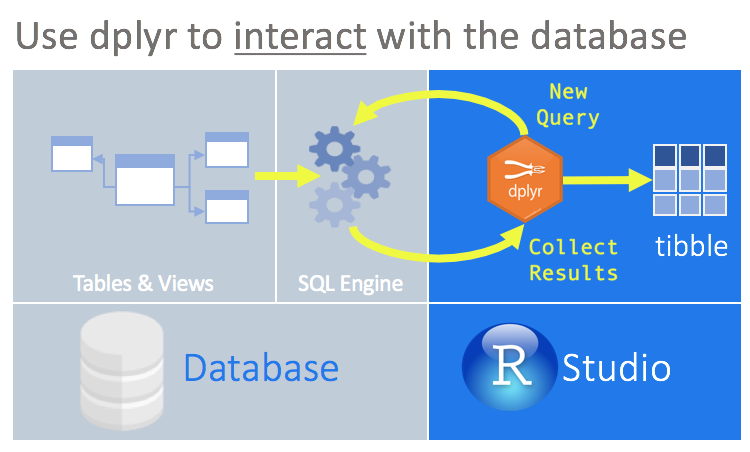 The dplyr package simplifies data transformation. It provides a consistent set of functions, called verbs, that can be used in succession and interchangeably to gain understanding of the data iteratively. Run data exploration routines over all of the data, instead of importing part of the data into R.
Use the SQL Engine to run the data transformations. In effect, computation is being pushed to the database. Collect into R only a targeted dataset. All of your code is in R. Becausedplyr is used to communicate with the database, there is no need to alternate between languages or tools to perform the data exploration. At the center of this approach is the DBI package. This package acts as ‘middle-ware’ between packages to allow connectivity with the database from the user or other packages. It provides a consistent set of functions regardless of the database type being accessed. The dplyr package depends on the DBI package for communication with databases. There are packages that enables a direct connection between the an open-source database and R. Currently, such packages exist for the following databases: MySQL, SQLite, PostgreSQL, and bigquery. Most commercial databases, like Oracle and Microsoft SQL Server, offer ODBC drivers that allow you to connect your tool to the database. Even though there are R packages that allow you to use ODBC drivers, the connection will most likely not be compatible with DBI. The new odbc package solves that problem by providing a DBI backend to any ODBC driver connection. If you are interested in creating your own package that connects DBI to a database, please review the article DBI Backend. Is the database you are interested in not listed here? You can still use DBI and odbc to connect and send SQL queries. If you would like to contribute a translation, please see the SQL Translation page in this website.